With the rest of the group back in one anothers’ good graces, the one remaining nut to crack is Shione, and she proves far tougher than the others, requiring the cooperation of all to get her (force her, really) to participate in their Hokubi Festival activity: building a planetarium. Yes, Waremete beat Sora no Method to a planetarium, but I’ll allow two because planetariums are cool. 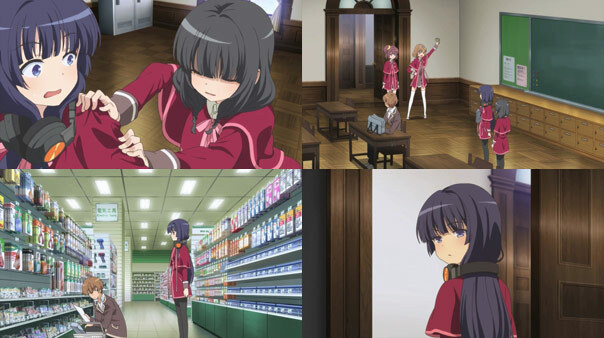 After Yuzuki acquires the school funding suspiciously quickly, the five go shopping that evening, then start building a prototype, which blows up in their faces. Through it all, Shione is present, if not the most involved, and I think it’s because she truly does want to be there with everyone else. It’s an effort, at least. Eventually, however, Nonoka involuntarily reminds her of why they’re no longer friends: her Big Lie about seeing the meteor shower. 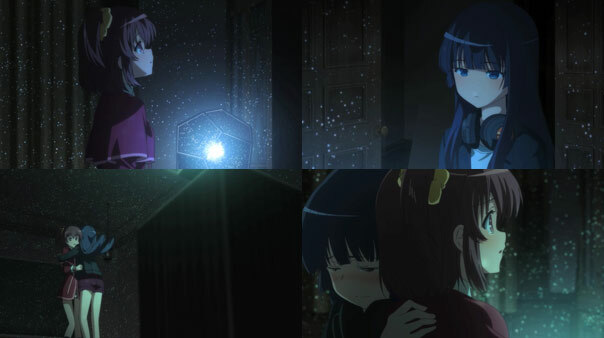 After Nonoka and Shione made that promise to see it, Shione returned to the same bridge to find only Noel, who relayed the message that Nonoka went far away but “will be back soon” to see the shower with her. Shione trusted the word of Nonoka-via-Noel, and waited for Nonoka to return, at the same bench, for six years. Every year, her trust in Nonoka eroded a bit, until by the seventh, it was all but gone, just when Nonoka finally returned. 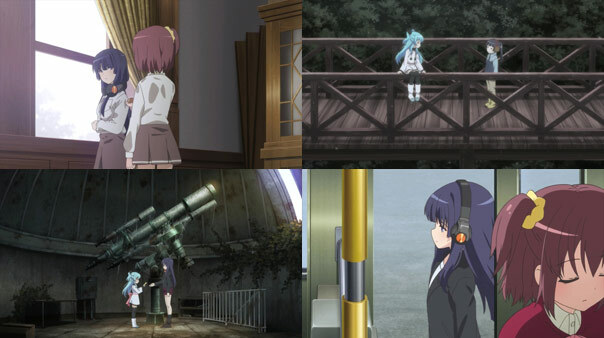 Visiting Noel in the abandoned observatory, Noel makes up for her poor phrasing seven years ago and through hugs, manages to engender the courage Shione needs to open back up and trust Nonoka again. After all, Nonoka did come back. 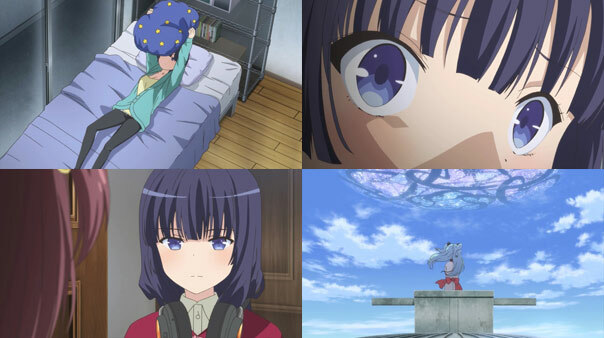 On a lark, Shione goes to school that night, where she finds not only Nonoka, but a room dramatically, magically lit by the stars of the properly-functioning planetarium device. There, Nonoka speaks first, telling her how awful she was for forgetting everyone, as well as her promise. Shione suddenly gathers her in a big hug and tells her she’s to blame for not trusting her. They agree to be friends again and part ways. So ‘Yay’, right, Shione and Nonoka are friends again! The group is back together, just in time for that meteor shower. But wait…uh-oh? 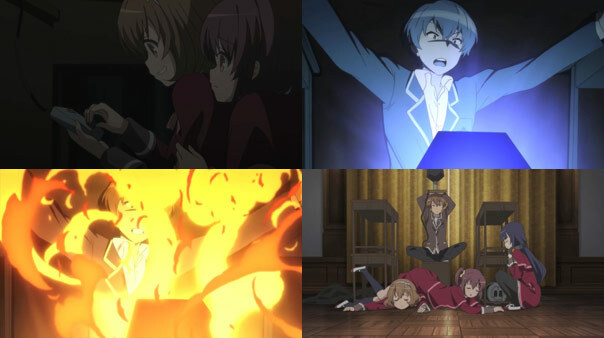 We should have known it would get more complicated with Shione involved. After considering what Noel said (about her “being the saucer”), the next morning a stern Shione tells Nonoka they can no longer be together. What’s all this about? Is Shione worried Noel will disappear? what you mean by “Noel said about being the saucer”.? ?